Volunteers got down and dirty at Middle River Park, cutting down dead trees and removing whole logs and brushes from the river itself. The group was by far the messiest but also insists that they had the most fun! 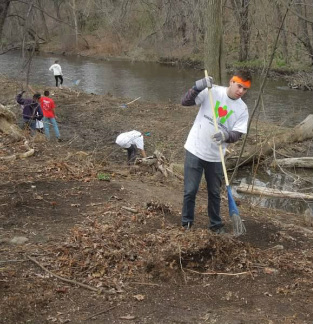 Working for Worcester volunteers cleared the river line, excavated the trails, and removed the dead brush and trees that were making the park almost unusable. Over 50 people worked at the park, ranging from neighbors to college students, to even Worcester area high school students. Cite manager Lucas Netchert planned and coordinated all aspects of this project at Middle River Park. To learn more about Lucas and the rest of the Working for Worcester managing team, click here.